Photo radar is now in use in at least one Toronto school zone, though drivers caught speeding won’t be receiving tickets or even formal warnings for the time being. The city has set up photo radar technology near the intersection of Don Mills Road and Overlea Boulevard as part of a four-month pilot project that began today with the return of students to public school classrooms. The photo radar technology will be used to record the speeds of drivers and capture images of licence plates but it won’t lead to the issuance of tickets through the mail until the provincial government changes existing regulations. The previous Liberal government did pass legislation last year allowing for the use of automated speed enforcement systems in community safety zones, though it will be up to Premier Doug Ford’s government to make the regulatory changes necessary to allow for tickets to be issued based on information collected using the technology. The intersection of Don Mills Road and Overlea Boulevard was chosen for the photo radar technology because of its proximity to two schools, though the equipment will eventually be relocated to other locations across the city to ensure a wide-range of data is collected. Speaking with reporters at the intersection where the four cameras were installed, Tory said that in order for the provincial regulations to be changed, the city must commit to the specific type of technology that will be used. That is why a pilot project is being conducted, he said. He said that while he would like to see formal warnings sent out until tickets can be issued, he noted that such a practice would require changes to city regulations, which won’t be possible until after the October election. The city has previously said that it expects full photo radar technology to be up and running in a number of school zones across Toronto by late 2019. 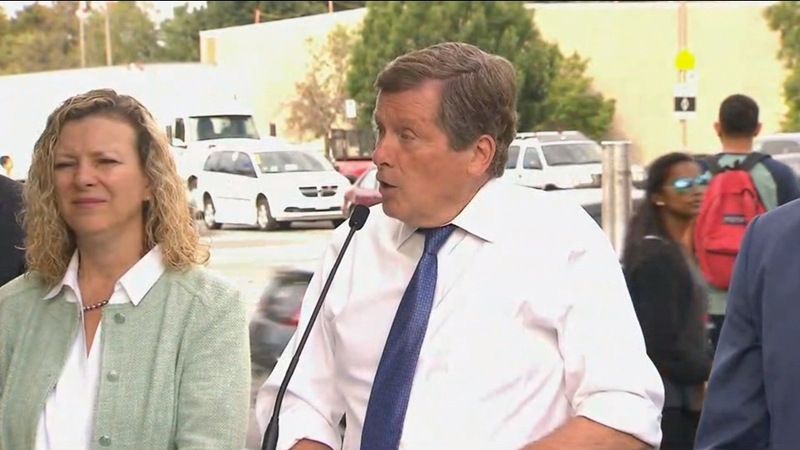 Mayor John Tory speaks with reporters near Don Mills Road and Overlea Boulevard on Tuesday morning.